The last device in the Moto X family was the Moto X 2015; the company hasn’t updated the lineup with new hardware since then, as the Moto Z seemingly took over. However, it looks like this will be the year we will finally get a new Moto X device. According to well-known leaker Evan Blass, the upcoming Moto X device will likely be named Moto X 4 — and not Moto X 2017 as it was previously rumored. It seems Motorola want to begin unifying the naming schemes across its product lineup, hence the numeric component in Moto X’s naming. While the original Moto X, the Moto X (2014) and the Moto X Pure had disparate names, this new “Moto X4” label does sound a bit off still considering the Moto G line, once parallel with the Moto X, is now at its fifth device with devices like the Moto G5 Plus. 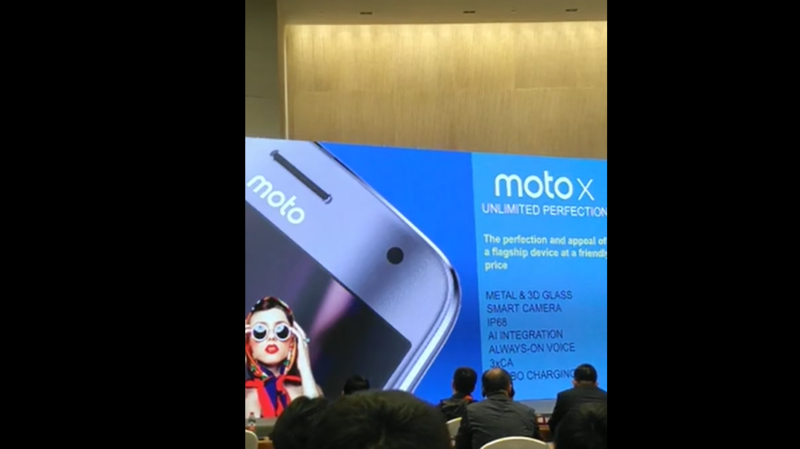 Meanwhile, a leaked video of Motorola’s presentation has surfaced on the Chinese micro-blogging site, Weibo. According to the video, the Moto X will have a similar design language to the Moto G5 Plus, sporting an all-metal body and a front-mounted fingerprint scanner. There is also a round camera bump on the back of the device, once again similar to the Moto G5 Plus. Specifications wise, the device is said to sport a 5.5-inch Full HD display, with the recently-released Qualcomm Snapdragon 660 SoC. It might not be the Snapdragon 835, but the Moto X line has offered less-powerful (and in the original’s case, specialized) chipsets in the past, and after the raving reviews the Moto Z Play received for its battery life capabilities, many people won’t be as quick to dismiss the 660. The device will also come with 4GB of RAM and 64 GBs of flash storage. There will also be a hefty 3,800mAh battery with support for fast charging. Interestingly enough, it looks like the Moto X4 won’t work with MotoMods. As you can see in the video, there doesn’t appear to be a pogo pin connector on the back of the device. It seems Motorola doesn’t want to bring modular functionality outside of the Moto Z lineup. As these are ultimately leaks and rumors, we’ll have to wait for Motorola’s official announcement to confirm these details.